I adore going to conferences. The best thing about attending one of these things is meeting all the people with similar interests and learning new things about the topic of the conference. I have attended a number of blogging conferences. Very Fun. I have attended tons of medical conferences. Love meeting up with old friends. But my favorite conferences, by far, of all time, are the ComicCons. My first experience with a conference of this kind was going to PAX in Seattle in 2009. I went with my son who was really into it and I expected that my day would be spent more in chaperone mode than anything else. After about 30 minutes walking through the exhibit hall together we split up and met back up again at the end of the day. It was one of the best conferences I had ever been to. Fortunately for me I didn't really know what I was doing and ended up in the line to get into see the Keynote speaker. The keynote speech was being given in a room that was at least the size of a football field with 3 jumbo trons set up at various points back throughout the room so that even those of us who barely made it into the completely packed room could see what was going on up on the stage. The keynote speaker was Ron Gilbert. I didn't really know who this was other than he was a game designer and I was at PAX (Penny Arcade Expo). Video of his talk can be found on YouTube in 5 sections. He totally knew his audience and it was one of the most interesting keynote speech I had ever been to. These conferences are so much more than Comic Book Conventions. They are nerdfests of the ultimate kind. John Green, author of The Fault in our Stars, had the best description of what it is to be a Nerd. I love this because I think it is one of the best things in the world to be a nerd and be enthusiastic about stuff. 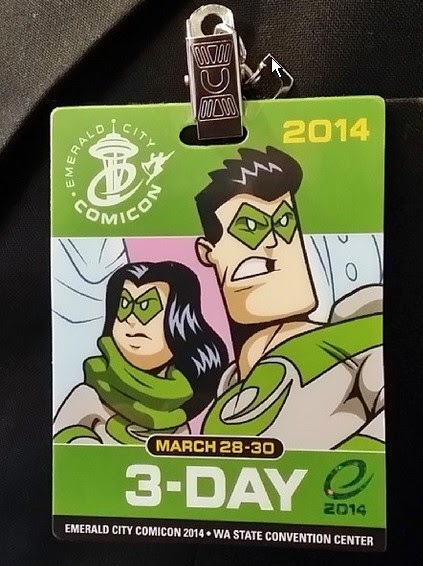 This last year my youngest son went to his very first ComicCon in Portland. It was the 2nd annual Rose City ComicCon. I suggested he just go and check it out but he decided he was going all in and would Cosplay as Cecil from Welcome to NightVale. He had an amazing time and is not completely hooked. For Christmas we gave him 3 day passes to go to the Emerald City ComicCon in Seattle. This event, mercifully, is right in the middle of Spring Break (WooHoo). It is really fun seeing Princess Leias and Batmans and Cosplayers from Homestuck walking down the streets of Seattle. For me it just says "All is right with the world". I love that there is a place for fans of all kinds of comic and fantasy series to get together and share their mutual love for the various productions. It is also really fun seeing families walking together and taking their kids with them to these conferences. My son has three costumes this time. He has lined up a different costume for each day. So, this weekend we are all about #ECCC #Arrow #RoosterTeeth #RWBY #Cosplay and whatever fun and fantasy finds its way into our epic adventure.